Steinlager Pure has been designed to transport you back to the pristine and pure lands of New Zealand with every bottle. Wherever you are in the world, Steinlager Pure teleports you via your senses. 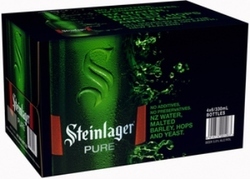 New Zealand's unique climatic elements that include mountains that rise to capture the moist westerlies, pristine waters and the purest air on the planet all combine to create the pure, clean taste of Steinlager Pure.